Will save an online registry hive to an offline hive file. Will restore an offline hive file to an online hive (a backup will be made next to the source hive file). Works on windows 2000 and up. Before you restore a hive, make sure you have a backup and that you know how to boot offline and restore your system files. updated for use also with Vista and later? Does it work for "online" Registry files, right? Maybe adding a checkbox for "All" that autochecks/autounchecks all the various hives would be handy. I need to check this tool (ERUNT) but indeed it looks similar. Dumpreg should work on windows 2000 and up. it uses regsavekey and regrestorekey. It saves an online hive to an offline hive file. I added a command line version to the zip file (uses the same unit code) : supports only the /S (save) for now (next version coming soon). I added a "all" checkbox in the GUI save form. Thanks for the feedback and suggestion ! Edit : the command line function can now save and restore. The DumpReg saved registry is far from complete (only 5 files), and in my Win 10 x64 DumpReg fails to save the security hive. which allows also offline registry restore in PE by simple copy of this structure. Nice , but wait a minute . I still believe that the command option /S or /R should go before target or source, but that is only a very minor issue, not worth the time it needs to be changed. The /S has the option to save ALL. The /R does not have the option to restore all but on the contrary needs to be told which hive to restore where (as I wanted to be safe). In red below the 6 registry hives I save. About ntuser.dat, is not this the current user hive? If yes, I save it using the current user SID in the form of 'S-1-5-21-2427513087-2265021005-1965656450-1001'. usrclass.dat is actually included in the current user hive. The /R does not have the option to restore all but on the conrary needs to be told which hive to restore where (as I wanted to be safe). (just ideas, mind you , the issue is only about the command(s) being as "symmetrical" as possible). The list includes at least 2 relevant programs with optional access to off-line registry. The new version still failed to save the security hive of my Win10 x64 system. Also the DumpReg software hive seems to be very small (5248 kB) as compared to the file found in config (59904 kB). TweakingRegistryBackup.exe creates in folder RegBackup a software hive of 59888 kB which corresponds good with the C:\Windows\System32\config\software file. Why not backup components and drivers hives, and may be also the less important Local Service and Network Service hives ? Will the system boot when you remove or corrupt these hives ? which will allow in PE environment restore by simple copy of the complete folder structure. Free choice of drive location for RegDump folder might be desired, since now it is fixed to system drive. You might wish to save registry in folder on other drive e.g. on USB-Stick. For the security hive, you need to run as system (default account under winpe but requires one extra step under windows). I see ERUNT thus manages the same without the need to run as system : will need to work this out. EDIT : dumpreg can now dump security. and may be also the less important Local Service and Network Service hives ? I believe they are included in the system hive. Not? dumpreg uses regsavekey and saves only nonvolatile keys. It does not save volatile keys. Also, there are different format of registry (w2k, xp, not compressed, ...) so before comparing size, we would need to be sure we are comparing the same formats. I will double check there for sure as indeed I suspect there is something wrong around the software dump (current user vs system one?). I am not sure I get it but now dumpreg and dumpregcmd are based against a folder to save/restore. HKEY_LOCAL_MACHINE\HARDWARE has no corresponding file because it is a volatile key that is created (and built) by the kernel at system start. Parsing the HKEY_LOCAL_MACHINE\SYSTEM\CurrentControlSet\Control\hivelist and then save all the corresponding items seems like a good idea, personally (but I am notoriously picky besides old and grumpy) I would dump the hivelist to a text file and use those paths for the restore (and also to "document" what has been saved in the folder and/or subfolders). Parsing HKEY_LOCAL_MACHINE\SYSTEM\CurrentControlSet\Control\hivelist definitely seems as a good idea ! Still, I still miss drivers and components in this hivelist which I do see in my system32\config folder. About using reg.exe as a batch, you would still miss the security bits : you need special privileges (i dont mean rights there) that erunt, dumpreg, ... take care off. Download Link for DumpReg does not work. DumpReg saves now 7 hives including security. The software hive is still far too small (about 10% is saved). There is an issue with the software hive indeed : investigating currently. Dumpreg saves the software hive from hkey_current_user despite being instructed to save the one from hkey_local_machine. ERUNT has that bug too on my win 8.1 system. Will add a "ok" button indeed. Will also look at drivers and components. Thanks a lot for the detailed feedback ! Side note : also looking for feedback for the restore function (more difficult to test i believe). EDIT : just added the "ok" message after save/restore. will look at your link. uploaded dumpreg 0.3 : was able to test with success a restore of the system hive on windows 7. -tested on xp, win7 and win8.1. 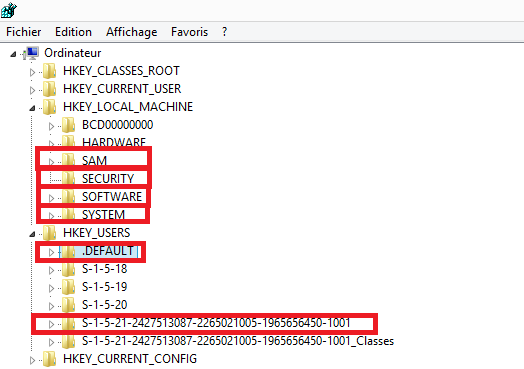 About HKEY_LOCAL_MACHINE\SYSTEM\CurrentControlSet\Control\hivelist, components and drivers are not listed on my system. I am wondering if adding the entries manually in HKEY_LOCAL_MACHINE\SYSTEM\CurrentControlSet\Control\hivelist would do the trick, i.e, have the files mounted as hives at next reboot ?